On An Overgrown Path: Does it serve the music or does it serve the ego? Does it serve the music or does it serve the ego? On February 29th 1960 an earthquake destroyed the Moroccan city of Agadir killing more than fifteen thousand people. All the buildings in the old city (kasbah) near where I took this photo were destroyed, and there was extensive damage to buildings in the port area seen in the middle distance. 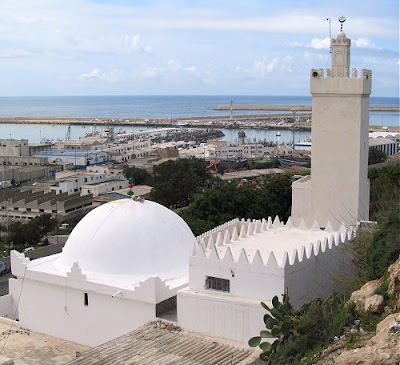 But the domed 17th century mausoleum of the Sufi marabout (holy man) Sidi Bouknadel seen in the foreground miraculously survived, with the mosque and minaret being added after the earthquake. At the core of Sufism is the belief that when a person displaces the lesser, egotistically oriented self, the greater or Universal self is revealed, which in turn allows contact with the Divine, and there is much that Western art music can learn from this thinking. When critiquing the current debasing of classical music the epithet ‘dumbing-down’ is often used, a description that plays into the hands of the revisionists due to its connotations of elitism. In fact dumbing-down and the associated obsession with entertainment and the mass market are just two manifestations of the ego-fuelled personality cult that has now spread virally beyond classical musicians to arts executives, broadcasters and, yes, bloggers. The acid test for a performance or piece of writing is to ask does it serve the music or does it serve the ego, because only when classical music displaces the currently dominant lesser, egotistically oriented self can its celestial gifts (baraka in Sufism) be unleashed. My soundtrack provides striking evidence of the power of ego displacement in the form of a Sufi samāʻ performed by Sheikh Mohamed Mehdi Temsamani and members of the Tijaniyya tariqa in Tangier, Morocco in 1996 and released on the Spanish Pneuma label. Esoteric - in the true sense of the word - rituals from North Africa may seem very distant from Western art music. But again there is much for classical music to learn. In his erudite sleeve notes for the beautifully presented CD – the whole project is as sticky as Moroccan mint tea – music director Omar Metiou writes of “the atmosphere and the interpersonal relationships established during a [Sufi] ceremony in which the kinetic, visual, smell and taste stimulations play as important a role as music itself” and it is these very stimulations that the revisionists are trying to exorcise from Western classical music. A very happy Easter to all my readers. Also on Facebook and Twitter. Header photo is (c) On An Overgrown Path 2013. No review samples were used in the preparation of this post. But acknowledgements to Richard Smoley and Jay Kinney's Hidden Wisdom and Jason Elliot's An Unexpected Light (both purchased) which were among my reading while following the Sufi way in Morocco. This is a wonderful post - cuts to the heart of the matter. Reminds me of that great phrase the Tibetan lamas often use for that quality of ego you're talking about here - "the self-cherishing ego". I was very mindful when writing the post that another great knowledge tradition - Buddhism - also stresses the subjugation of the ego. But introducing that into the narrative clouded things rather, so I restricted the discussion to Sufism. There is so much to learn from the perennialists who embraced all these great wisdom traditions, and I will return to the subject - in the context of Tibetan Buddhism in fact - in a future post. Do not give me scissors, a Sufi said, but a needle; I do not cut, but weave. Yes billoo, there are many wonderful Sufi sayings. I think the need to subjugate the ego is at the heart of Claudio Arrau's article 'A Performer Looks at Psychoanalysis', written for High Fidelity in 1967 and reprinted in Joseph Horowitz's Conversations with Arrau. I've been banging on about the primacy of that need for a long time, and I do find that many people are baffled by it at first. They often think that it means to be without ego at all, and thus a sort of vacuous entity. The key here is to make clear the distinction between the healthy ego and the bad, and usually it can be made clear with one illustration. It requires ego for a pianist to appear at Carnegie Hall in a recital entirely of Beethoven sonatas and, to boot, let's say like the late Charles Rosen's recitals of the 'Waldstein' plus three of the late sonatas, the 'Hammerklavier' included. If the ego involved is healthy, the pianist will have undertaken this because he/she truly believes they have something to say about the sonatas while in performance subjugating all ego in service to the composer, the music, and the audience. This is what Rosen did, and in their time titans of the order of Arrau, Solomon, either Fischer, et al. If the ego involved is that bad one, either the performances will reveal nothing whatever to the audience, nothing beyond the notes, or, and worse, the music will be subjugated to the pianist's ego, which is saying only see how fast I can play this Allegro (no matter that the composer added 'Non Troppo'), can you hear these hidden lines I've discovered (though putative 'hidden lines' inevitably detract from the main line, those long main lines that Solomon was famous for and the secret of which Cherkassky, of all pianists, tried to learn from Solomon in the late 1950) -- in sum, distortions of any sort as the pianist of unhealthy ego tries to claim the work as 'his/her own'. Thinking of Lyle's comment, perhaps one might say that there is the 'self-cherishing ego' and the 'other-cherishing ego'. A very happy Easter weekend to you and the family, Bob.